One of the greatest living ballerinas, Bolshoi Ballet’s prima ballerina Svetlana Zakharova will perform in the Universal Ballet’s “La Bayadere,” returning to Seoul for the first time since 2005 when she performed Giselle with the Universal Ballet in her late 20s. Although it has been some 13 years, Zakharova said that does not make a huge difference. “I still feel like I am a student. There is still much to learn. I am working on this project, and it keeps me going,” Zakharova said during a press conference Monday at the Sejong Center in Seoul. Zakharova added that she still tries hard to keep her performance sharp, both physically and emotionally, while emphasizing the physical aspect of ballet. Zakharova already has engagements lined up until 2020, according to officials from Universal Ballet. Born in Ukraine in 1979, Zakharova has been a trailblazer. In 1995, Zakharova participated in young dancers’ competition Vaganova-Prix, where she received second prize and was invited to enter the graduating class of St. Petersburg’s Vaganova Academy -- the first time in the institution’s history to allow a student to skip two grades. Zakharova joined the Mariinsky Ballet after her graduation in 1996. In 2003, she moved to the Bolshoi Ballet. Winner of two Benois De Le Danse awards, in 2005 and 2015, Zakharova is well known for her extraordinary techniques. In “La Bayadere” -- an iconic 19th century ballet by French dancer and choreographer Marius Petipa -- Zakharova will perform Nikiya, the beautiful temple dancer who fights for the love of a warrior Solor. “I personally think ‘La Bayadere’ is one of the most difficult but one of the most beautiful ballets,” Zakharova said. She also singled out the Kingdom of the Shades scene, which is marked by a moonlit stage and some 30 dancers’ performance in unison. The introductory part of the scene is regarded as one of the best ballet blanc, a term used to refer to a ballet scene where performers wear all white. The first and second acts are characterized by their Indian-themed costumes and sets, Zakharova added. 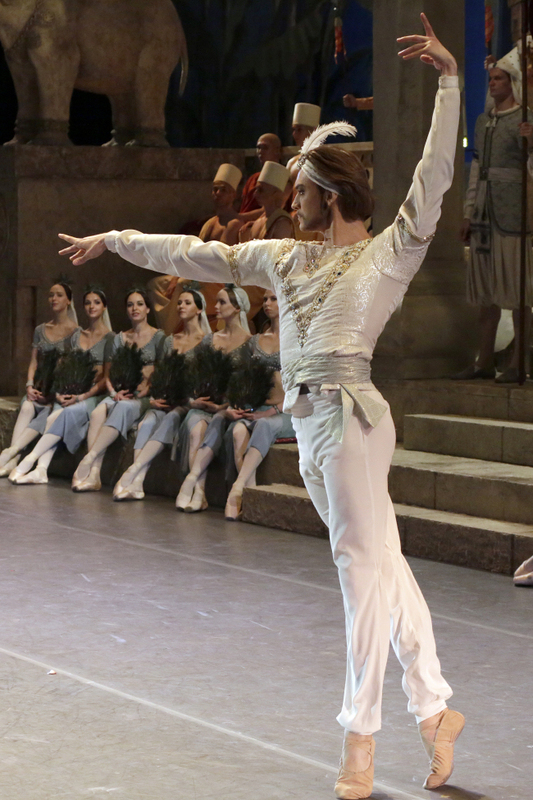 Meanwhile, Boshoi Ballet principal dancer Denis Rodkin will perform as Zakharova’s romantic interest, warrior Solor. The winner of the Benois de la Danse prize for 2017, Denis Rodkin has performed as Zakharova’s partner since 2013. “I feel very lucky having the chance to perform together with Svetlana. With Svetlana, I have learned new emotions and ways of expressions when working on the pieces I thought I already knew, as if I were visiting the pieces for the first time,” Rodkin said. “La Bayadere” will be performed Thursday to Sunday with two performances on Saturday at the Sejong Center. The Zakharova and Rodkin pair will perform Thursday and Sunday. Universal Ballet performed Korea’s first “La Bayadere” in 1999 at the Sejong Center and this week’s performances are part of a program celebrating the 40th anniversary of Sejong Center.